The end of 2017 is here! I accomplished two exciting 50K goals this year and had a ton of fun at races and a relay in between. It was nearly impossible to choose only a few highlights from such a great year of running. Here's my overview of the year, plus what I'm looking for out of 2018. One: Canyons 50K was my big, scary goal for the year and successfully completing it made me feel like a rockstar. 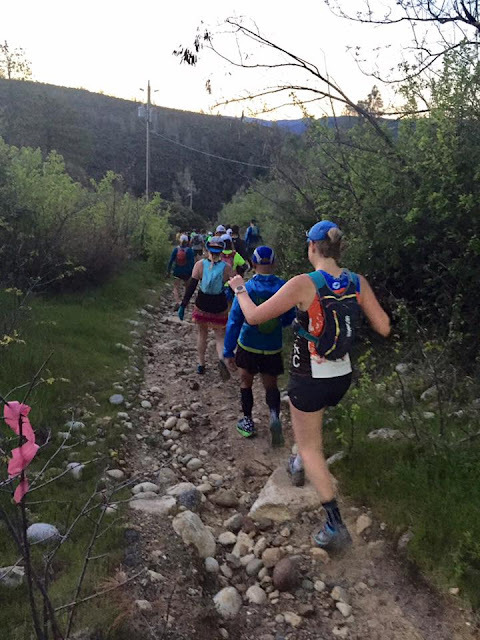 The course follows the Western States trail from Foresthill Elementary School (one of the big aid stations during Western States 100) and is an out-and-back through some of the hardest climbs on the WS100 course, totaling ~9200 feet of elevation gain. I knew going in that this would be a huge challenge and the most time on feet I've ever experienced, and I was incredibly nervous. That said, I'd had my eye on this event since it started a couple of years back and couldn't wait to get out on those trails! Following the conga line to the creek crossing in the early miles. The day was a big success - my body cooperated, I loved the trails and scenery, and I enjoyed time with both new and familiar trail friends along the way. My training was properly peaked for the challenge thanks to my coach, Jenny. And last, Kevin came along and ran the super difficult 25K course plus many friends (thanks Jenny, Chris, Alisyn, Matt!) came to cheer us on, hang out at the finish, and have post-race beers. It was the perfect day! Check out my full race report here. Race director high fives are the best! I finished in 9 hours 10 minutes, ahead of my goal. 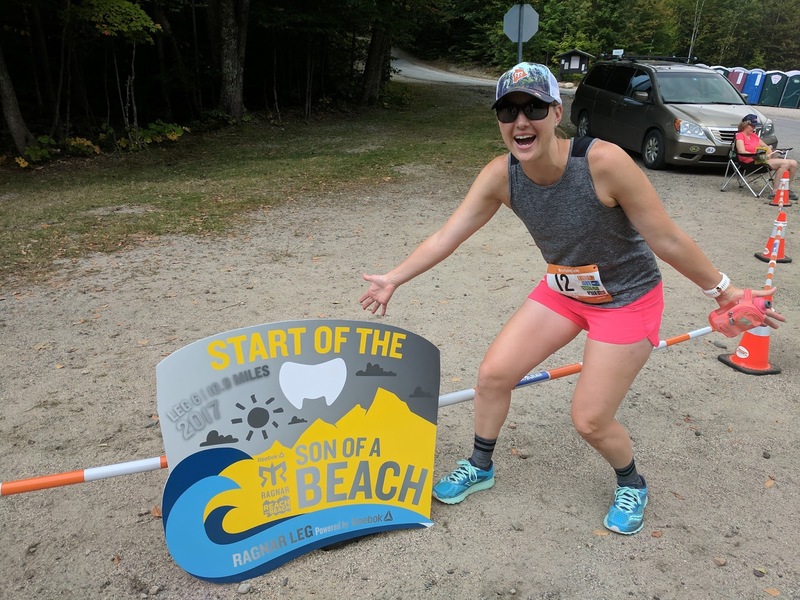 Two: We traveled with friends to Boston and New Hampshire to run Ragnar Reach the Beach Relay, which now goes into history as one of my favorite relays ever! Kevin and I, plus our friends Eddie and Jason, flew out to Boston and met up with other team members who live on the East Coast. We had a killer team both in speed and personality, and this was the most time I've ever had with both vans together. When we arrived in Boston, we went straight to a team dinner at a BBQ place in the city, which of course had great craft beer choices too [because Eddie and Steve picked it]. The following day, both vans met at the start line to check in and do the safety briefing. This is something different about Reach the Beach than other relays I've done. The first leg of the race actually ran a loop around the ski resort back to the start area, which gave us even more time to hang out together. Kevin kicked off the show as runner 1...straight up a ski run and back down. This was my first time in New Hampshire, and I particularly enjoyed the fall colors and mountain views. The landscape was fantastic the entire way! I ran the 'Ragnar leg' for the event, which earned me a special medal for the longest single leg of the relay at 10.9 miles. Starting my longest run, 10.9 miles. We finished on the beach on Saturday afternoon; as van 1, we had time to play in the ocean while we waited on van 2. It was COLD but beautiful, and I loved the beach finish area. We ended the evening with a team dinner at a fun restaurant along the drive back to Boston. Thanks to our whole team for making this such a great experience! Team photo on the beach! We finished in 27:15:36, 18th in the men's open division. Not bad at all! As I reflect on 2017, I realize how lucky I was to share so many runs with friends. It's impossible to choose only one best run, so I'm adding photo highlights instead! Day at Diablo with Kate and Sophia - creek crossings, learning to use poles for Broken Arrow, and epic climbing. Go Far Eclipse viewing run at Rancho. Epic day, epic group, and epic eclipse. One of my hardest long runs during Canyons training - Kev joined me for 25 miles and 5000+ feet of climbing. A foggy but wonderful day in Marin for the SFRC run - and a big group of friends! 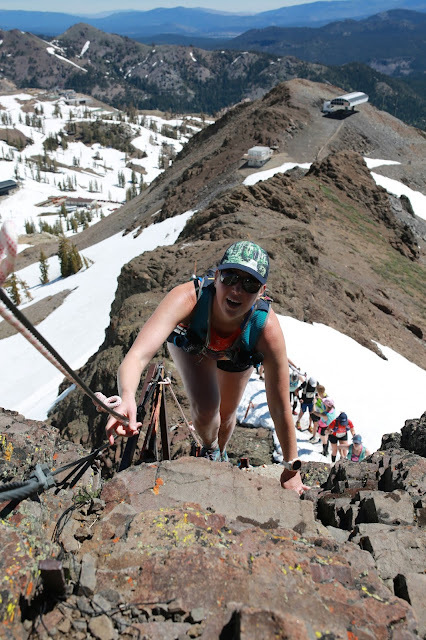 Broken Arrow Skyrace 26K - an epic mix of altitude, snow, black diamond ski runs, and ladders. My best running advice came from my coach, Jenny, during Canyons training: she included hiking in my training plan. It sounds so simple, right? But I previously never focused on my hiking skills. My usual approach to hills is to run as much as I can and walk when I need to. Knowing that Canyons would require a lot of hiking due to the significant elevation gain, Jenny added 'hike all uphills' to my heavy vert long runs. It was mentally hard to do because it results in feeling like I'm not trying hard enough at times (not to mention slower Strava segments...) but it worked. I had some leg and glute cramping from all of the extra hiking when I first started, but by Canyons my body was primed and ready for it. The moral of the story? I'm not saying everyone should hike all of the uphills because we are all training for different goals. The big lesson is that race-specific training can make a huge difference in the outcome. Sophia, me, and Jenny before Overlook 50K in September. These two inspire me! My most exciting running moment was pacing Ali for 23.6 miles of the North Face 50M! This was my first pacing gig, and I was honored to be part of Ali's first 50M experience this past November. The whole day was really fun because of the local trail community and friends participating in the race. 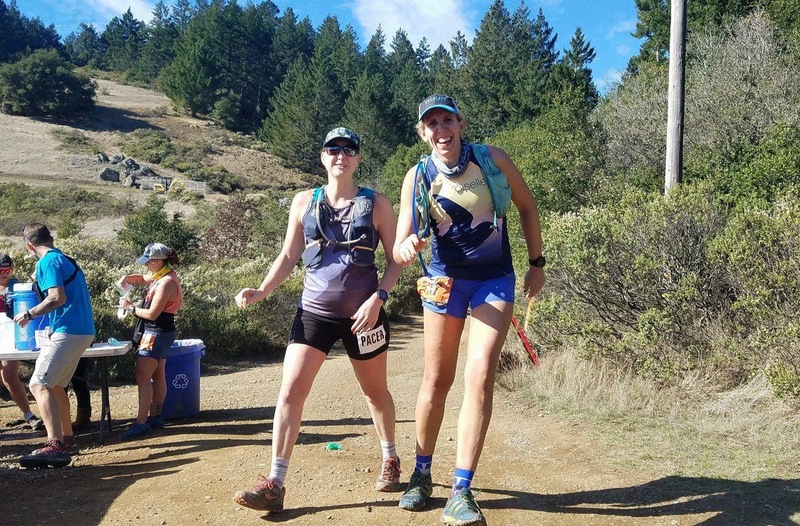 I met Olivia in SF and we traveled to the Stinson Beach aid station together in the morning; she was pacing Sophia for the same section that I would be pacing Ali. 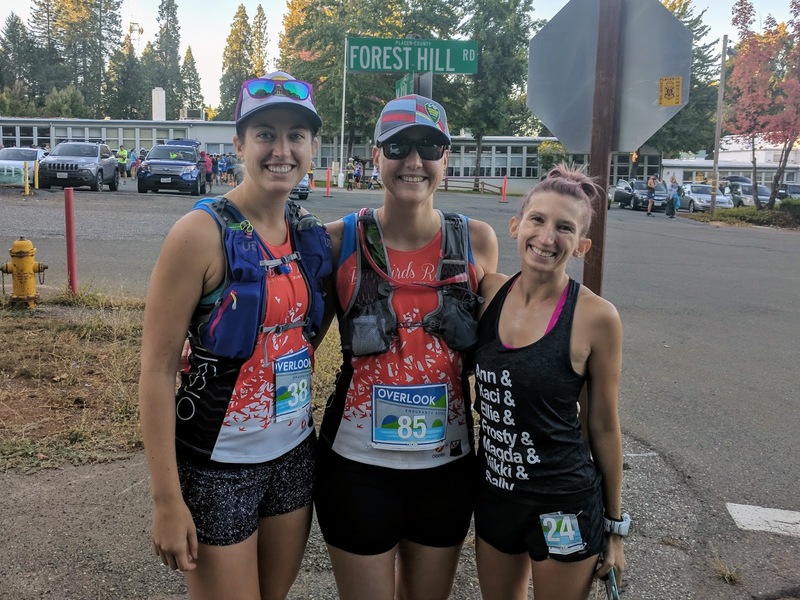 We enjoyed cheering for runners at the aid station, and I was also happy to hang out with my Go Far friends who were crewing and pacing Marcia that day. Sophia came in strong and continued on her way with Olivia. Ali arrived at Stinson Beach a bit later, and after a few minutes at the aid station we headed out along the big Dipsea trail climb to Cardiac. Ali had unfortunately twisted her ankle pretty badly coming down Matt Davis before I met up with her, and she did an amazing job of fighting through that pain plus leg cramping during the race. We made it to the Cardiac aid station and gained extra motivation from Michael, one of the most supportive and enthusiastic ultra runners I know. Ali's leg cramping became severe after Cardiac, so we were tight to cutoffs for the rest of the race. However, she pushed through like a champ and stayed in a positive mood. 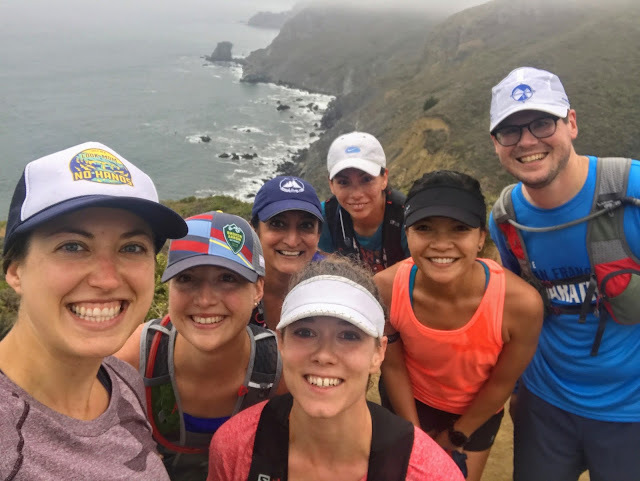 I was worried we wouldn't make the cutoff at Tennessee Valley, but we passed it with only seconds to spare and continued up the Marincello climb. Ali running along one of the ridges with a beautiful view. I especially loved running across the Golden Gate Bridge at night to the race finish line in Crissy Field. It was a surreal experience to run the bridge, know Ali was going to be successful, and to be by her side. Thank you Ali for letting me be part of your day and for inspiring me! 2017 was a very successful year of running for me, with 1338 miles run and 138K feet climbed as of today. I didn't have a specific goal for these stats, but now I want to go for 150K feet of climb next year. So close! If I'd have been paying attention, I have faith I could have hit it. I do love Strava stats. Last long run of 2017, spent with friends in Marin. A great ending to the year! My goal for 2018 is to run my first 50M ultra. I initially planned to run Marin Ultra Challenge 50M in March, however I'm now looking to push it back to later in the year so that I have more time to build mileage. 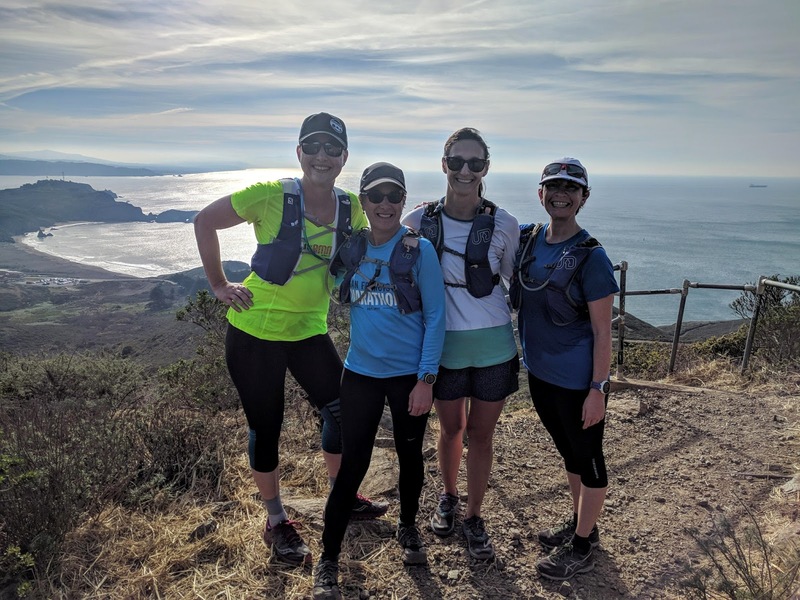 I'm still planning to run the Marin Ultra Challenge 50K and look forward to my second 50K in Marin. The other item on my to do list for 2018 is the Memorial Day Weekend Western States training runs, specifically the Saturday run. It's the hardest of the three days because it's 32 miles long (pending snow changes) and includes the canyons. I have run a lot of the course between Canyons 50K and running from Last Chance when volunteering for WS100, and I can't wait to see those trails again as well as new parts of the trail. I'm sure I'll find other goals as 2018 gets going, but for now these are my top two. I hope everyone has had a great 2017, and Happy New Year!